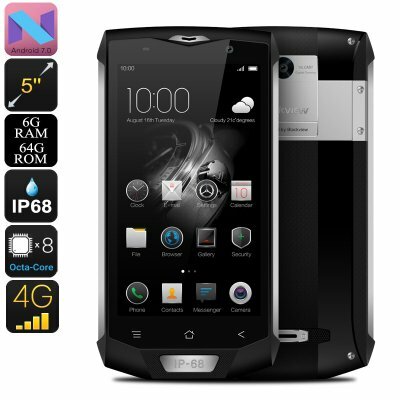 Successfully Added HK Warehouse Blackview BV8000 Pro Android Phone - Android 7, 16MP Cam, 2-IMEI, IP68, Octa-Core, 6GB RAM, 1080p (Silver) to your Shopping Cart. Enjoy the outdoors without worrying about breaking your Android phone with the Blackview BV8000 Pro smartphone. This rugged phone features a durable IP68 design. This means that your smartphone is waterproof and furthermore resistant to dust and drops. With Corning Gorilla Glass 3, even your display is protected against scratches and bumps. This rugged smartphone is perfect for those of you that often head outside or work in rough environments. No matter where you take this beauty, nothing will be able to stop it from functioning properly. By supporting Dual-IMEI numbers, this Android smartphone allows you to be reachable on two phone numbers at the same time. It furthermore lets you connect to two 4G network providers. This brings along great efficiency for when traveling abroad. No matter where you’ll be heading, with the BV8000 Android phone you’ll always stay connected. The rugged phone furthermore packs a stunning 16MP rear camera. This piece of equipment allows you to shoot breathtaking images and FHD video. From now on, you’ll always be able to snap pictures and share those special memories with friends and family back home. Packed within its IP68 rated body you’ll find the MediaTek6757 chipset. This Octa-Core processor has been clocked at 2.3GHz and brings along plenty of power. Along with the phone’s 6BG of RAM, you’ll be able to enjoy the latest and most demanding mobile Applications. 64GB of internal storage and a 32GB SD card slot offer plenty of space to store the media of your liking. Whether it’s games, movies, or Apps – this rugged smartphone supports them all. With a 5-Inch Full-HD display at your disposal, you’ll be able to enjoy all in crisp 1080p resolution. A powerful 4180mAh battery treats you with an unbelievable amount of juice. You’ll be able to get through multiple days of regular smartphone usage without needing to worry about recharging. This means that you can head out with confidence as this epic battery will never let you down. The phone runs on Android 7.0, meaning you can enjoy a smooth experience while taking the most out of the hours’ worth of continuous usage time it has to offer. This rugged phone comes with a 12 months warranty, brought to you by the leader in electronic devices as well as wholesale electronic gadgets..